Visit two glacial-fed alpine lakes whatever the season. 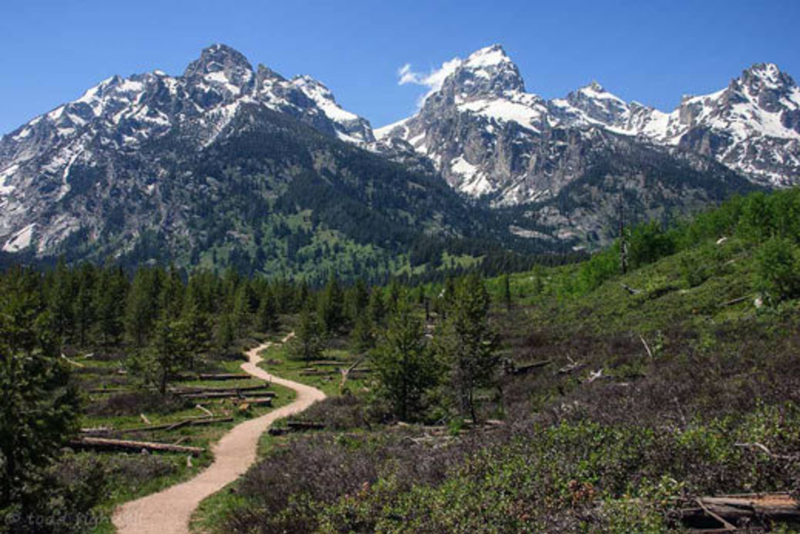 There are no totally flat hikes in Grand Teton National Park. But there are a couple of flattish ones. The trails to and around Bradley and Taggart lakes are the mellowest of the park’s flat trails. Expect a few gentle hills; none are more than 150 feet though. If you just go the 3.2 miles to Taggart Lake and back to the parking lot, there is about 272 feet of climbing. If you just want to do one hike in this area and want it to be the shortest possible, that’s the trail to Taggart Lake: 1.6 miles one-way. Make this hike slightly longer by taking the southern loop from Taggart Lake back to the parking lot. It’s 2.4-miles instead of 1.6. From the eastern shore of Taggart Lake, you get jaw-dropping views up Avalanche Canyon. Look for Shosoko Falls at the bottom of the canyon’s north fork. A bridge across the lake’s outlet in its southeastern corner makes for a wonderful picnic spot, albeit not a particularly private one. Plein air landscape painter Jim Wilcox, who is based in Jackson, says this is one of his favorite spots to paint. A smidge north of Taggart Lake and separated by a glacial moraine—both lakes were formed by receding glaciers—Bradley Lake is slightly smaller. To us, it feels slightly more alpine than Taggart. 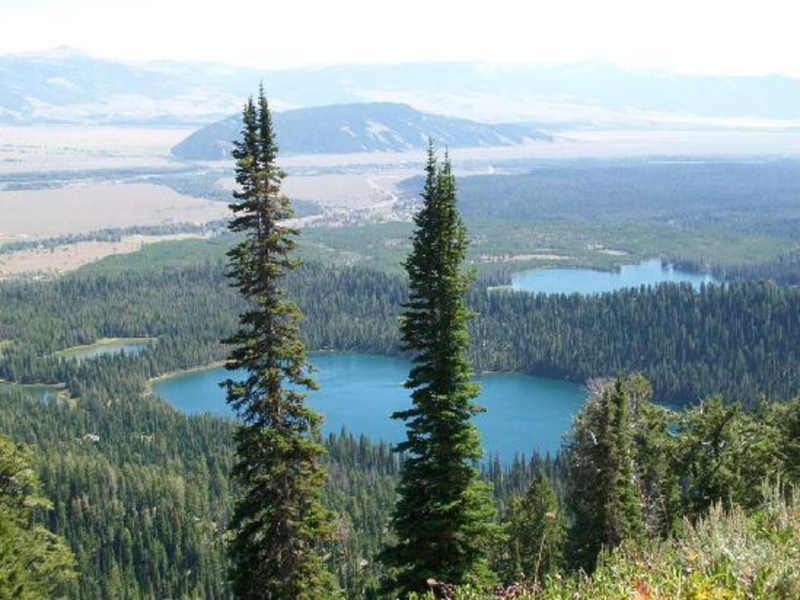 Taggart Lake sits at the foot of the Tetons. Bradley Lake feels tucked into the foot of the Tetons. The trail to Bradley Lake often follows and, a couple of times, crosses Taggart Creek (or a Taggart Creel tributary). The park has built bridges at these crossings. In 1985, a forest fire tore through this area and there’s still plenty of evidence of that. New aspen and pine trees are poking up, but downed trees are everywhere. As you head for Bradley Lake, if you remember to look behind you, you’ll get some views back down to Taggart Lake. You’ll also be able to see up Avalanche Canyon. The final bit of the Bradley Lake trail is a descent down to the lake. Bradley is less than a mile further than Taggart Lake, but it gets much less traffic. In winter, the Inner Park Loop Road closes just past this trailhead parking lot. That makes this area the most popular in the park for snowshoers. It gets so much traffic, you can often walk around a bit without snowshoes; the trails get packed down that much. 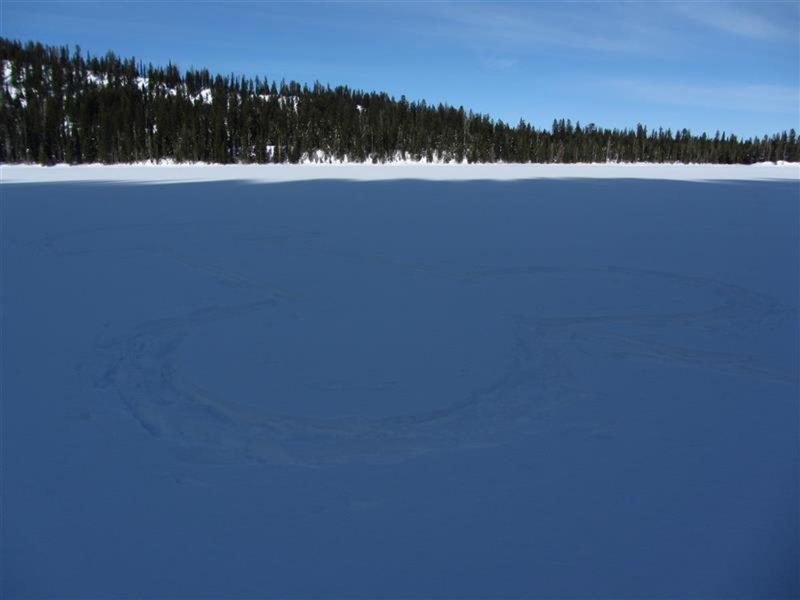 We’ve seen people that made it all the way to Taggart Lake without snowshoes. Backcountry skiers also pass through this area en route to skiing 25 Short, Shadow Peak, and Garnet Canyon, among other lines. 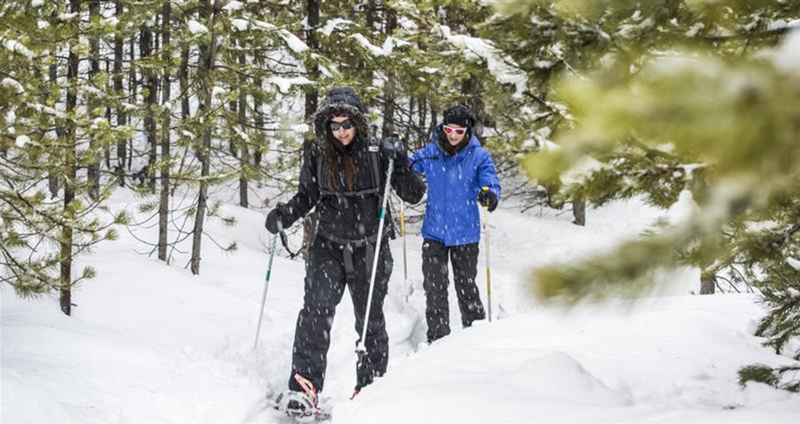 If you do walk around the area without snowshoes, please, please, please do backcountry skiers a big favor and do not walk in their tracks if you are post holing through. This makes it dangerous for them. Hikers looking for flatter trails. A web of trails fans out from the Bradley/Taggart lakes parking lot, about four miles into the park from the Moose entrance. Any of the trails heading west and/or north will get you to one of the lakes.